It has been awhile since I posted. I have a LOT of tea photos since my last post in July (wow, has it been that long? ), but have mostly been posting on Instagram (@hstupno). There seems to be more activity there than here. I have also switched themes on my blog to a more up-to-date look. It should be more user-friendly on mobile as well. I have decided to keep this blog more for myself than for others. I like to share my tea photos and resources, but I’m not looking to make money or light the world on fire with riveting prose about tea. I just enjoy it and I like sharing it. And I have this blog set up, so I may as well use it! It’s just finding the time and energy to post, especially during specific times of the year, that I have difficulty with. Hopefully this New Year will bring new experiments and travels in the tea world. We shall see! On to today’s post! The first weekend of January brings colder temps and a light, crusty coating of snow to our Maine property. The perfect time of year for cozy tea. If we only had a roaring fire place. My Instagram friends inspire me with their photos, but can also make me feel quite inadequate in my photography skills, settings, and indoor upkeep. I miss taking photos outside in these cold, gray months. 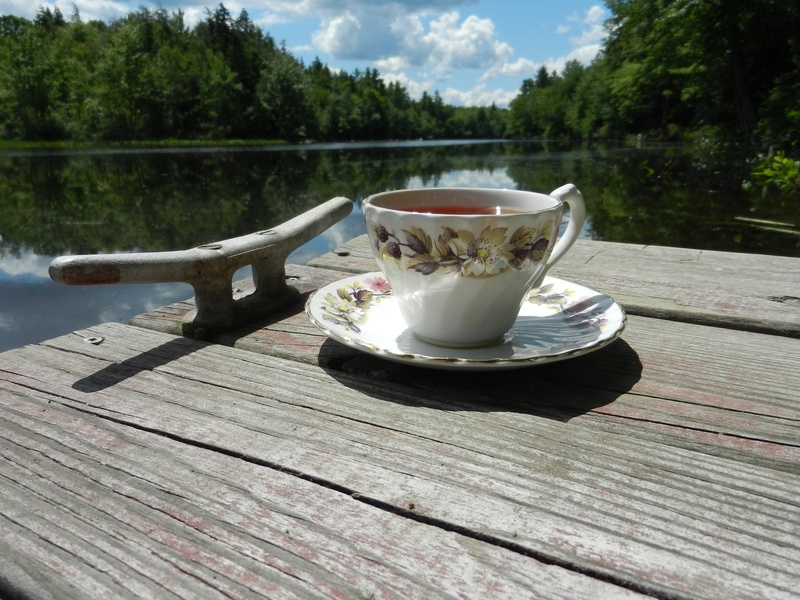 Nothing like having that green grass and stream as the perfect backdrop for my tea photos. It’s hard to find places inside where clutter, or a random shoe or cat toys doesn’t appear. Today I wanted to open that wonderful jar of homemade Cinnamon Current Jam my friend Deb in New York made me for a Christmas present. She is a wizard at using their home grown fruit trees and making delicious jams, jellies, and other goodies. AND she shares them! I whipped up my favorite two-ingredient Pumpkin Muffins yesterday. Just a heads up: if you make this recipe before you us a 15 oz. box of Duncan Hines spice cake mix. The smaller size box makes a better muffin. Then I grabbed my container of up north! tea from my Twitter friends Tozy Tea. I love this blend and it’s perfect for a winter brew. I have chatted with Chris and Heidi for several years now. Tozy Tea donates 10% of their profits to the education of needy children. They also package their product in recycled paper canisters as opposed to metal cans. Their tea sachets are made of 100% biodegradable corn-starch. Check them out! Their Christmas Star tea is also a winner in my book. Food and tea was chosen, then I need to determine which of my teapots and teacups to use. Today I chose one of my early favorites from the days Dave and I were “courting”. I lived in New York at the time and he lived in Maine. To avoid expensive trips back and forth, we’d find a spot half-way and meet there, which in our case was The Berkshires in Massachusetts. At the time (late 90’s) there was a wonderful vintage shop in the town of Lenox and they sold tea ware. I started collecting this fine bone china set on those trips. It’s the Allyn Nelson Collection made in England. Between the dark wood tray and the tea set is one of six Irish Lace, linen napkins. I wish I could say I purchased them during out trip to Ireland this past Spring, but it isn’t. I picked them up during the summer back in the states. But they ARE still Irish, and the lace is lovely. Tea was poured, muffins were selected, and butter and jam presented. It was ALL good and even Lexie decided to join me for a visit.